The national secretariat of the ruling All Progressives Congress was practically on a security lockdown yesterday, following a violent protest by youths protesting against the adoption of direct primaries for the APC senatorial ticket in the Federal Capital Territory FCT. The protesting youths who said they are FCT natives said the use of direct primaries would mean that a non-FCT native could clinch the ruling party’s ticket for the sole senatorial seat. While they chased security operatives at the gate away, no party official was on ground to address them. They said since all contestants for the various positions in the FCT agreed on the use of indirect primaries, they were at a loss as to why the National Working Committee would impose the direct method on them. They claimed that the party was planning to impose a particular aspirant on them, pointing out that through the indirect mode, they are sure that an indigene of the FCT will emerge as the candidate of the party. The youths who became violent, pulled down the security wire around the Secretariat and destroyed the billboard in front of the Secretariat while locking up the entrance into the Secretariat and daring the police to shoot them. 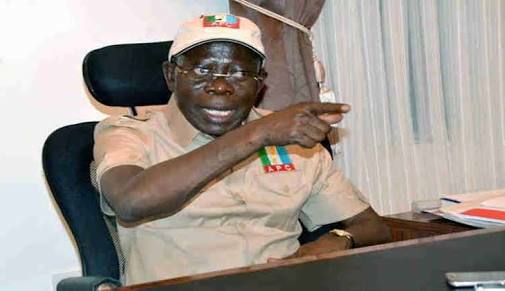 However, the arrival of the Commissioner of Police in the FCT prevented what would have turned into a brutal confrontation between the police and the irate you who chanted anti-Oshiomhole slogans. Some of the protesting youths who were later dispersed by the police, promised to launch a more vicious attack on the secretariat should the NWC decision not be reversed. About 9 aspirants are contesting the Senatorial primary in the FCT.